In his 2003 National Book Award-winning memoir Waiting for Snow in Havana,Carlos Eire narrated his coming of age in Cuba just before and during the Castro revolution. That book literally ends in midair as eleven-year-old Carlos and his older brother leave Havana on an airplane—along with thousands of other children—to begin their new life in Miami in 1962. It would be years before he would see his mother again. He would never again see his beloved father. 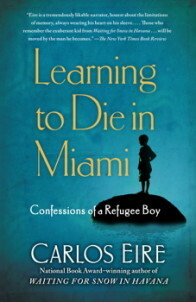 Learning to Die in Miami opens as the plane lands and Carlos faces, with trepidation and excitement, his new life. He quickly realizes that in order for his new American self to emerge, his Cuban self must “die.” And so, with great enterprise and purpose, he begins his journey. But as Carlos comes to grips with his strange surroundings, he must also struggle with everyday issues of growing up. His constant movement between foster homes and the eventual realization that his parents are far away in Cuba bring on an acute awareness that his life has irrevocably changed. Flashing back and forth between past and future, we watch as Carlos balances the divide between his past and present homes and finds his way in this strange new world, one that seems to hold the exhilarating promise of infinite possibilities and one that he will eventually claim as his own. An exorcism and an ode, Learning to Die in Miami is a celebration of renewal—of those times when we’re certain we have died and then are somehow, miraculously, reborn.